2 How do you use Widget:Google Calendar? The Google Calendar widget allows you to add Google Calendar widget to your wiki page. How do you use Widget:Google Calendar? This widget accepts many optional parameters, allowing you to customize how your shared calendar looks. height and width define calendar dimensions, 100%x600 is default (only width can be defined in %). color - events color (hex value. e.g. 5229A3) - only color used in Google's wizard can be used. lang - interface language (en, fr, ru and etc). style - The style attribute to be applied to the iframe. 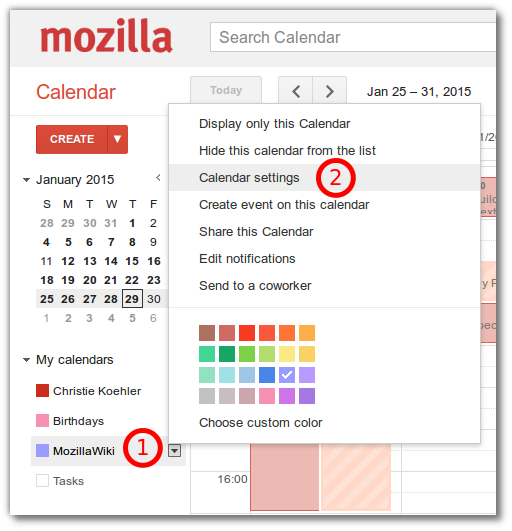 In order for the calendar to be visible on MozillaWiki, you need to share the calendar publicly. Step 1: Go to the settings page for the calendar you want to share. 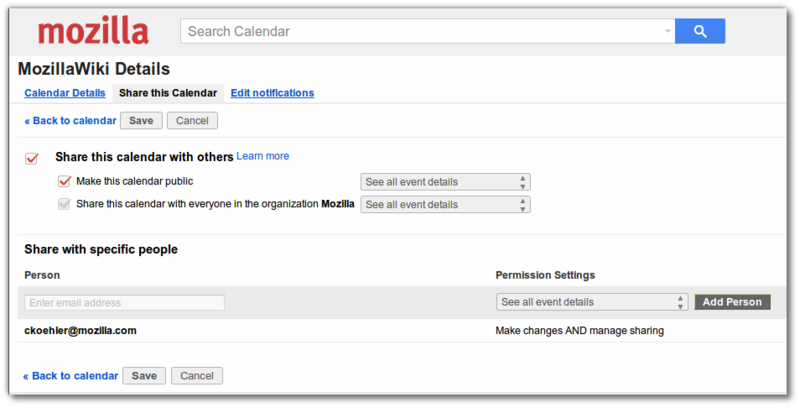 Step 2: Click the Share this Calendar link and modify the sharing settings as needed. You'll need to check Make this calendar public in order to allow all MozillaWiki visitors to see your embedded calendar. Please be sure you want to share the details of this calendar, including attendee details, before you share it. This example shows US holidays. This page was last modified on 30 January 2015, at 05:13.